The Medicare Access and CHIP Reauthorization Act (MACRA), passed in April 2015, is a landmark piece of legislation that represents a dramatic change in the way CMS will pay healthcare professionals. 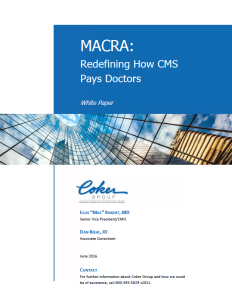 While complex and not entirely defined, all providers should learn as much as possible about MACRA to avoid costly under- or overreactions to the new requirements. The reader will receive definitions of many unfamiliar terms and acronyms that are a result of the legislation. This paper addresses the significant changes in quality reporting systems, billing systems, and most importantly, care delivery systems that will be required to operate successfully under MACRA rules and regulations. Preparation should start immediately in provider organizations affected by MACRA.